PPT was born from the ambition of Peter Sampson, a man determined to be a major influencer in the way water treatment systems are designed, engineered and built. Creating products focused on enduring performance and the individual needs of the customer is a promise fulfilled with every delivery. The application of these principles was soon extended to the realm of solvent purification and dispensing systems and these three products remain the mainstays for the people whose lifework they benefit. Peter was always happiest when configuring and improving machines. He built his career around his ability and gift to problem solve all things mechanical. Initially working for his Dad in the semiconductor industry, he acquired 8 years of additional industry knowledge and experience from a position with a large semiconductor OEM. A companywide lay off opened the door for Peter to start a new adventure as a business owner. He made a decision in 1999 when associate told him about a water purification company from Germany that was looking for a North American dealer to introduce their products to the US. In the role of business development, he started promoting large commercial RO based lab water systems. Thus, SG Water USA was founded. By 2006, solvent purification systems were successfully added to the product lines and by 2012, having outgrown the relationship with their German counterparts, the company parted ways and was renamed Pure Process Technology, to better represent their new direction and complete product options. 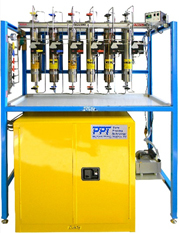 facilitates demand for PPT’s water and solvent purification and dispensing solutions. 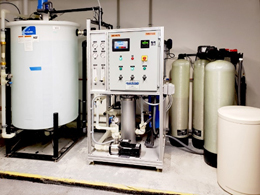 These systems are employed for a myriad of applications in such fields as biopharma, medical, R&D research facilities, agriculture, and universities for meeting high purity water and pure dry solvent demands. A new chapter: A website to better represent our journey as well as our future path. Our journey is one of gaining knowledge, experience, expertise and a supportive client following. PPT’s accelerated growth, over the last few years, has mandated the expansion of manufacturing space, fostered enhanced engineering processes, and facilitated the development of innovative products. This much activity cannot be accurately shared through any form of communication other than a new website. Today we are excited and proud to share our new site with the world. 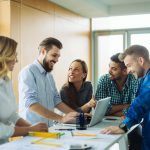 Our focus and main goal, in developing this new site, is to deliver an efficient, positive user experience to those seeking information, qualifications, and purchase options for high purity water and solvent purification/dispensing systems.